Trent Nikolic: Traditionally, boxing’s heavyweight division is the one that gets the most attention. Something to do with the big boys and their savage, one-punch-knockout power. Middleweight, however, has always been the glamour division. With fast, nimble, deceptive all-rounders – it’s the division the purists love to watch. Hagler, Hearns, Jones Jnr, De La Hoya, Trinidad, Hopkins, and more recently Golovkin. The list of former greats reads like a Who’s Who of the best pound-for-pound fighters of all time. In the automotive world’s hot-hatch division, the Volkswagen Golf GTI has long been the reigning all-rounder king. Not always the fastest, not always the most dynamic at the circa-$40,000 price band – yet capable of throwing punches in bunches with its unrivalled blend of fun and finesse to accumulating points in every round to gradually wear down rivals. Plenty have tried to steal its belt, and plenty have failed. Yet now comes a fresh challenger from South Korea: the $39,990 Hyundai i30 N that squares up to the $41,490 five-door Volkswagen Golf GTI. If ever there was a title fight with far-reaching ramifications, this is it. What started as a running joke of boxing analogies in the CarAdvice office quickly became serious when the gravity of what we were about to undertake set in. No-one gets to dethrone a lineal champion easily. As such, we decided on three judges for this twin-test, unprecedented in any two-car shootout I can think of at CarAdvice. Jez Spinks, Rob Margeit and myself (Trent Nikolic) set out to find the best hot hatch, with a boxing-influenced scoring system to determine the winner. Spinks has driven every GTI since Mk IV, Margeit the same, and I’ve driven every GTI from Mk I on. Yep, we aren’t taking this lightly. We employed the trusty 10-point ‘must’ system, as it’s called. We came up with six ’rounds’, with the winner scoring a 10-8 round (we wanted a bigger gap than boxing’s 10-9 ‘winner’ margin) – unless there was a ‘knockdown’, which would lead to a 10-7 result. If the combatants couldn’t be separated, the round could be scored a 10-10 draw. We’ll publish those scores from each of the three judges below, along with our traditional score out of 10 as you’d see with any other comparo. Our judging was secret, from the wider editorial team and from each other. No discussion was entered into when comparing either vehicle during testing – we didn’t want one judge’s opinion influencing the others. Alright, enough of the hype (and time to turn off the Eye of the Tiger soundtrack). Over to Jez Spinks for the round-by-round commentary, as we get the Golf GTI and i30 N into the ring for this massive hot-hatch title fight. Seconds out, round one: Ding, ding! No rival for similar money has been able to penetrate the GTI’s guard when it comes to interior presentation and user-friendliness. The GTI’s strong defences are immediately on display. Its trademark Tartan cloth seats still look great – and continue to feel like a genuine retro touch rather than a parody of the original. They play a key role in distinguishing the GTI from regular Golfs, along with the liberal use of red stitching throughout the cabin. Another reason to save money by ignoring the optional leather seats is that the standard seats provide a superb blend of cushioned comfort and supportive torso/thigh bolstering. There are nice details, such as the embossed GTI badge on the steering wheel, and the dark-grey trim inserts on the dash and doors that continue the honeycomb theme from the grille. Overall, Volkswagen has neatly managed to retain the slick and sophisticated look of the regular Golf interior while injecting some sportiness. Last year’s 7.5 model update also introduced a smarter-looking and smarter-working touchscreen (covered in more detail in the next round). Step across the Hyundai’s N-logo treadplate and there’s some initial disappointment in discovering a bombardment of rigid, dark-grey/black plastics. Only the upper sections of the dash and doors have been treated to softer materials. More punches fail to land with underdone sporty details. The N logos are barely registerable on the sports seats and are missing completely from the mats. The stitching in WRC blue – as with our test car’s hero exterior colour a nod to Hyundai’s i20 rally car – is a nice touch if a bit subtle. That colour is also used for two key buttons (more of which later) on the suitably chubby steering wheel, though not all judges were fans. Without suggesting the bolstering is underdone, you don’t feel quite as snug in the i30 N’s seats. The driving position could go even lower, ideally, though you’re not perched on your seat as in a Ford Focus ST/RS. We’ve become accustomed to writing that the Golf sets the benchmark for mainstream small car interiors, yet there are areas where the i30 rated higher in the judges’ views. Subjectively, the i30’s dash design is visually more interesting and even more cohesive. The Golf’s dash also has some joins that jar slightly. Objectively, the tactility of the Hyundai’s audio and temperature switchgear is – unexpectedly – slightly superior with a more expensive and more consistent feel than the Golf’s. And the i30’s softer upper-door plastics are replicated in the rear, where the VW switches to harder plastics in a blatant cost-cutting move. It’s a stalemate for back-seat space – a six-foot adult can sit comfortably behind their driving position. Toe space isn’t perfect in either. You sit in the Golf’s outer seats more, though, and only the GTI comes with rear vents. The Hyundai also takes a narrow points win for storage with its bigger smartphone storage section under the centre stack, a slightly larger console bin, and cleverly positioned and generously sized door bins. It clearly has the larger boot. While on paper their capacities are separated by just one litre (381 v Golf’s 380 litres), in reality the i30 more easily swallowed our large- and medium-sized suitcases we used on test. The depth of the boot just means luggage isn’t quite as easy to extract as it is in the flat-floored Golf, while the Hyundai’s seatbacks-folded versatility is hindered by a rear strut brace – which is removable, thankfully. Both boots provide a 12-volt outlet; the i30 N adds a floor net. In a round that pundits and experts alike would have predicted to go the German’s way, there’s a shock result with the judges unable to split them. Merely some gentle sparring in this round, though covering areas that can’t be dismissed as irrelevant in our digital age, even for hot-hatches. As previously mentioned, the GTI was upgraded with VW’s new Discover Media system as part of 2017’s ‘7.5’ Golf update. The 8.0-inch dark-glassed touchscreen alone helps to take the Golf’s sophistication up a notch, while it delivers a big ergonomic tick by tilting the centre stack in which it’s contained towards the driver. Graphics are sharp and in design match the maturity the Golf is generally renowned for. Buyers can also upgrade to a larger, 9.2-inch touchscreen featuring non-touch Gesture Control. It’s part of a $2300 Infotainment Package that also throws in a high-tech 12.3-inch instrument display and a 400-watt Dynaudio Excite audio system with digital amplifier and subwoofer. Finger smudges are the main downside to either (dark) touchscreen. The i30 opts for a tablet-style, dash-protruding design for its 8.0-inch touchscreen, and if not as aesthetically slick as the Golf’s set-up it doesn’t let down the overall harmony of the Hyundai’s interior design. Its dead-straight positioning means it’s not quite as easy for studying the display, such as maps – though the guidance graphics are a match for the Golf’s. The graphics used elsewhere – particularly the vehicle components presented for the customisable settings – are excellent. There’s also an integrated ‘race computer’, featuring lap-timer, g-force meter and gauges/charts for power, torque and boost pressure. Both cars provide some physical shortcut buttons, and each provides smartphone integration via Apple CarPlay and Android Auto, while only the Hyundai is standard with digital radio. GTI buyers instead have access to digital apps via the AppConnect interface. Autonomous emergency braking, tyre pressure monitoring, fatigue alert, and LED headlights/tail-lights are inclusive on both models. The Hyundai’s starting price, mind, does already save buyers $1500 over the GTI, and it also comes standard with launch control and lane-keeping assist. Volkswagen offers a reasonably priced ($1600) Driver Assistance Pack that gives the GTI lane-keep assist, along with blind spot detection, rear cross-traffic alert, semi-automatic parking, anti-dazzling auto high/low beam, and adaptive cruise control. None of those features are available as an option on the i30 N, and all up the GTI gets the nod of every judge in this round to nudge further ahead. Two rounds in, one apiece: the GTI is already discovering it’s got a real fight on its hands. The Volkswagen would expect to feel more comfortable in our Ride/Refinement round – and it is, just like its occupants. 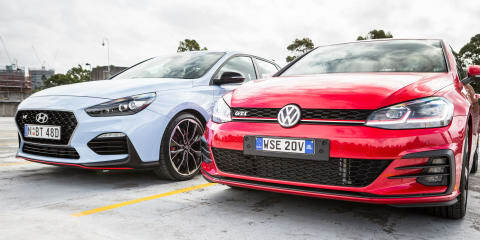 Keep the GTI in its default Normal mode and its suppleness and absorptive abilities ensure its guard is always up against the nastiest surfaces Australian roads can throw at it. 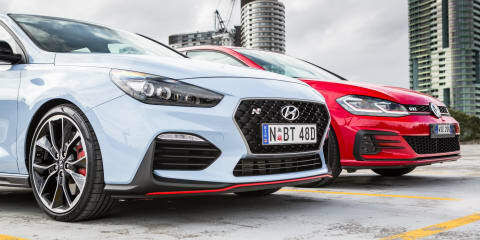 Hyundai Australia’s tuning team says it softened the Normal suspension setting compared with the European spec, though there’s still an ever-present firmness to the i30 N’s ride. It’s slower to settle over urban speed bumps, jiggles more on rougher surfaces, and can crash over potholes that induce only a loud noise in the GTI. Volkswagen’s hot-hatch is the more relaxing drive along typically rough country roads, too, and produces less noise from its tyres across coarse-chip. Conversations with back-seat passengers are still easy in the Hyundai, and the Korean hatch deals competently with road joins. Crucially, no judge said they couldn’t live with the Hyundai on a daily basis. The respective adaptive damping systems prove to be effective, then, while both models provide a customisable set-up – allowing a mix of responses/aggression from the steering, suspension, drivetrain and stability control. And in the Hyundai’s case, also its e-LSD and active exhaust. The i30 N, in fact, provides a mind-boggling total of 1944 possible combinations with all its variable settings. No single combination makes the i30 N feel as civilised as the GTI, however, and the Hyundai loses further points with a much wider turning circle and steering that feels a bit heavy when attempting parking or three-point turns. A convincing round for the velvet-gloved Golf – with one judge declaring a knock-down. Halfway through, and the Volkswagen is looking ominous with a maximum 90 points. It’s time for a rumble in the jungle. Well, at least in one of Sydney’s heavily forested National Parks. The GTI enters the second half of The Big Fight with a healthy points lead, having displayed all its excellent everyday-driver traits that have helped ward off so many challengers over the years. It may also be feeling confident as we head into the dynamics assessment that is also essential for any hot hatchback… After all, Hyundai has no form as great driver’s cars go. Sure, the 2002 Tiburon was mildly entertaining, but the only model you would call remotely sporty in recent years is the Veloster – and that’s more interesting to look at than it is to drive fast. Hyundai’s new N performance division, however, is now run by former BMW M division guru Albert Biermann. And we’ve already experienced what he’s helped Kia achieve with the Stinger. N stands for Namyang, Hyundai’s massive research and development centre about an hour south of Seoul, but it was Germany’s notoriously long and mega-fast Nurburgring where the i30 N was most intensively tested. Hyundai’s serious, then. And in the i30 N’s armoury is an electro-mechanical limited-slip front differential, electronic adaptive suspension, an active variable exhaust, and 19-inch Pirelli P Zero rubber developed specifically for the Hyundai. It sits 8mm lower than a stock i30, and a reinforced front subframe and stiffer suspension are complemented by the aforementioned rear strut bar across the boot. As we head into driver’s territory – winding roads littered with fast and medium sweepers, S-bends, and ultra-tight hairpins – both contenders are switched into their most aggressive vehicle settings: Dynamic for the GTI, Sport Plus for the i30 N.
The GTI is changed by pressing a Drive Mode button on the centre console and then selecting the Dynamic graphic on the touchscreen. It firms-up the Golf’s adaptive dampers and sharpens throttle response. The i30 N’s steering becomes more fluid away from city confines, and the extra meatiness of Sport Plus suits the hatch’s mini-muscle-car feel. There’s the same 2.2 turns lock to lock as the VW but the i30N veers into corners with greater sharpness. With our two hot hatches bobbing and weaving, ducking and diving, through our undulating loop of thrilling bitumen, this is just the first jab to the GTI’s body before the Hyundai unleashes a flurry of dynamic punches. Both cars offer progressive brake feel, but the stronger bite from the i30 N S stoppers give the driver greater confidence to dive deeper into corners. The GTI can’t match its rival’s exit speed, either. The i30’s e-diff setup cleverly monitors throttle input and steering-wheel angle, then instructs the hydraulically-activated clutch pack on the front axle to send the appropriate amount of drive to the outer-front wheel. And the harder you stomp on the throttle mid-corner, the more effective the electro-mechanical diff seems to be – providing incredible traction, and with only a momentary hint of torque steer that doesn’t cause any deviation from your chosen line. That line can be adjusted with a lift of the throttle, with full confidence that the rear end – with a wider track than the front – will follow obediently. Clearing apexes in the GTI requires more judicious use of the loud pedal. Inverted commas are required around its ‘e-diff’ as the system takes a cheaper route to minimising mid-corner wheelspin, by simply using the stability control system to dab the brakes of the inside-front wheel. You get what you pay for, because try to drive the Golf hard out of a corner and its struggles are both audible (squealing, spinning inside-front wheel) and visual (the flickering orange traction control light in the instrument panel). The Hyundai’s power-down performance is also impressive along bumpy straights, including clearing one notorious test-route dip that has spiked the revs of many cars we’ve tested here as they’ve momentarily lost purchase on the surface. The i30 N has the GTI on the ropes at this stage, and it then floors the German with an uppercut of defter footwork in challenging S-bends. With the protagonists chasing each other through a fast left-hander that straightens only briefly before being followed by a sharp right-hander, the i30 N transfers weight with ease where the GTI – already leaning that bit more – is still coming upright as the change of direction is requested. It’s proof that the e-Diff isn’t the only key to the Hyundai’s handling magic. The i30 N’s weight-transfer agility is aided by an electronically-controlled suspension that continuously adjusts damping forces at individual wheels – up to 100 times per second – responding to g-forces, speed of steering inputs, and the position of the steering wheel and throttle pedal. The GTI may have been bruised, battered and a bit bloodied in this round, but that red-striped, black-honeycombed grille is no glass jaw. Volkswagen’s performance icon is still good fun – and easy – to drive quickly. The i30 may sting like a bee, but the GTI floats like a butterfly – weighing in 105kg below the 1429kg i30, for example. The lightness contributes to a car that remains enjoyably poised and chuckable. And while the steering offers less feedback than the i30, it’s beautifully linear and incorruptible. Its talents just start to come undone beyond eight-tenths driving, where the i30 N’s abilities almost demand you take it to a racetrack. And that’s even encouraged by Hyundai, which permits non-competitive track days under the car’s warranty. Hyundai Australia surprised many by opting against a two-tier i30 N range – ignoring the entry-level, 184kW version to focus on the 202kW version known as the ‘Performance Pack’ in other markets. Eyebrows were further raised when a sub-$40,000 price tag was announced. We almost wonder if the company’s product planners got their calculators out, because when looking at the bang-for-the-buck factor the i30 N’s $198 per kilowatt figure undercuts the long-time affordable-performance champion – Subaru’s 197kW $39,240 WRX – by just one dollar. The GTI asks $248 for each of its 169 kilowatts – or a below-the-belt $267 if you want to match the i30 N’s 6.2-second 0-100km/h time with the DSG-only, three-door-only, 180kW GTI Performance 1 that costs $47,990. VW’s standard, five-door GTI manual is a couple of tenths down on the Hyundai. The i30 N also has the Golf’s measure through the gears, based on the judges’ seat-of-the-pants feel, though the gap isn’t as decisive as the power outputs might suggest. The top end of the i30 N’s 2.0-litre four-cylinder turbo engine doesn’t feel as urgent or enjoyably exploitable as the engine of another (more expensive) hot-hatch we could mention – the Civic Type R – so it feels more like a battle of mid-range turbo torque against the GTI. And maximum torque is much closer between the duo, delivered across a similar spread of revs: the GTI’s 350Nm produced between 1500 and 4600rpm versus the i30 N’s 353Nm from 1450 to 4700rpm. Hyundai’s mid-range just feels that fraction chubbier in hard driving, courtesy of a temporary overboost function that kicks in under full throttle for up to 18 seconds, lifting torque to 378Nm (between 1750 and 4200rpm). Both engines impress hugely with their relative lack of turbo lag and their ability to deliver power in a consistently linear fashion. No contest for soundtracks. Where the GTI sounds arguably too refined, needing the DSG gearbox for fast-shifting exhaust blurts, the i30 N brings more theatrics through induction whooshes and pops and crackles on over-run with the bi-modal exhaust. It’s all enhanced by an Electric Sound Generator at the base of the windscreen. If you don’t want your neighbours to think a WRC round is being staged through their street, the active variable exhaust can be toned down by switching it to Sport (where it still gurgles purposefully) or Normal (where it’s quieter while still hinting that you’re driving something sporty). The GTI counter-punches with its manual transmission. Supported by excellent clutch pedal weighting, the VW’s gearlever moves from gate to gate with relatively smooth accuracy. Swapping cogs in the i30 N is slightly reminiscent of the shift action in a WRX – notchy and not as satisfying as would be hoped. It’s also no coincidence that the Hyundai’s less consistent clutch pedal feel and slightly less tractable engine off idle contributed to the i30 N being stalled three times during testing (though only by one judge – no names!). And for the majority of Australians who prefer a two-pedal setup, an eight-speed dual-clutch auto won’t be available for the N until late 2019. An extra $2500 brings a seven-speed dual-clutcher into play for the GTI. The i30’s rev-matching system, though, is effective (and can be switched off by heel’n’toe connoisseurs) and the shift feels better with the firmer actions of quick driving. ROUND 6: WHICH WOULD WE BUY? Heading into the final, crucial round, the i30 is ahead on points but it’s hardly an unassailable lead. And this is hardly the first time the GTI has been slower or less dynamic than a challenger, each time fending off attacks with a package that has been more than the sum of its parts ever since the Mark 5 restored the badge’s credibility in 2005. So, again, it comes down to assessing which hot-hatch best blends performance and handling with everyday ride comfort and practicality. There’s still no denying the Golf GTI’s remarkable polish. Its refinement is outstanding for a hot-hatch, and the cabin looks more upmarket than ever after 2017’s update. It’s a family hatch that couples compact-car versatility with a strong dose of sportiness in the way it looks and drives, and – unlike its rival for now – offers an automatic gearbox. It’s no wonder the GTI has at times accounted for one in four Golf sales. Hyundai has come out swinging on value, though – undercutting the Volkswagen on price, and upper-cutting it with its array of extra dynamic features. You would need to spend another $8000 on a GTI for the Performance edition that adds a proper mechanical front diff and matches the N’s 19-inch wheels, as well as getting closer to the Hyundai’s overboosted torque (370 v 378Nm). Does Volkswagen need a new standard five-door GTI manual variant that adopts the Performance’s more powerful engine and proper front diff? The i30 N certainly asks the question. The South Korean brand has also done a decent job on the i30’s cabin, ensuring it’s not embarrassed by the Golf’s benchmark interior presentation – despite a shortage of soft-touch plastics – while being marginally ahead of it for practicality. And while the GTI better isolates its occupants on patchy roads, the i30 N doesn’t require its owners to completely compromise on commuting comfort. The judges felt it was a fair trade for the greater thrills the Hyundai delivers on the open road. A fiercely contested title fight, then, but the verdict is unanimous. While the i30 N didn’t win all of the rounds, the Hyundai put in a stunning all-rounder performance. It’s simply a brilliant first effort from Hyundai’s N performance division – one that punches well above its price weight. Ladies and gentlemen … introducing the new, undisputed $40K hot-hatch champion of the world: The Hyundai i30 N.